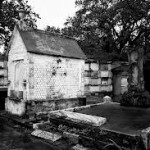 The Haunted Mortuary is a haunted attraction that began its life as a Victorian mansion, built in 1872 by Mary Slattery. In 1928, PJ McMahon purchased the property to turn it into a giant funeral business, which performed some 20,000 funerals occurred here over the years. So the story goes, when the building was purchased by an owner who wanted to make it a mortuary-themed haunted house, he got more than he bargained for. The new owner soon realized it was really haunted. There were a ghostly woman in white, a tall well-dressed man, a boy and a girl who play pranks, a former mortician, plus footsteps, whispers, moving objects, and much more.